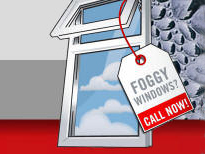 Window Defoggers LLC offers a quick, effective, low-cost solution to foggy window condensation problems. Many people are unaware of the difference between glass replacement and window replacement. Window replacement is very costly and involves replacing the entire window frames, affecting the siding and trim of your home. Glass replacement involves simply replacing the glass portion of the windows, leaving your existing frames and trim intact. All windows, whether wood, aluminum or vinyl are designed to easily remove just the sealed double pane IGU (Integrated Glass Unit). You no longer need to replace your entire failed double pane windows. We can restore the clarity and insulating R-value at a fraction of the cost of full window replacement. Glass replacement is easier, quicker and less disruptive to do than full window replacement and can be done any time of year. If you have failed seals or foggy windows, we can assess your current windows and offer you choices like matching your current units or upgrading them to more efficient windows. Contact us for a free assessment or request a free quote today. Window Defoggers LLC specializes in quick turnarounds, no hard sell tactics, education of the client and challenging jobs that other companies are ill-equipped to handle. For the typical job, from order to installation is usually about one week, two weeks max. We also specialize in repairing the wood-framed Weathervane windows so popular here during the 80’s and 90’s. Weathervane windows have a unique construction design that makes them challenging to repair and only a few glass replacement companies deal with them. Window Defoggers LLC can repair your Weathervane windows for 1/3 the price of full window replacement. Window Defoggers LLC serves Seattle and the Eastside including Bellevue, Bothell, Fall City, Issaquah, Kirkland, Mercer Island, Redmond, Renton, Sammamish, Snoqualmie, Woodinville and cities north of Seattle. If you have fewer than five failed windows, use our fast free online quote form. If you think you have more than five failed windows, or you want a whole home or business assessment, please contact us at 425.623.3590. For the fastest response on quotes, please use our quote request form. B&P Window Defogger LLC is licensed, bonded and insured.